"But he really is completely lovely -- just so desperately unlucky." Languishing in one of the cages at Yorkshire Cat Rescue (YCR) in Keighley, West Yorkshire, is a disillusioned and extremely unhappy thirteen-year-old brown, gray, and white male named Harvey. His feelings are easy enough to comprehend once one realizes that his world has been turned upside down during the course of the past eight months or so. Absolutely nothing has been disclosed about his first twelve years on this earth but given that he was able to have persevered for that length of time in this ultra-ailurophobic world is a pretty good indication that his prior life was not all that shabby. The security and sense of well-being that he previously had enjoyed ended abruptly last December however with the death of his guardian. No specifics have been divulged so it is impossible to speculate as to the circumstances but, quite obviously, no provisions were made for Harvey's continued care in the event of such an occurrence. Even though that could have been because his owner had not expected to kick the bucket quite so soon, that still does not excuse the deceased's surviving relatives for dumping him at YCR. That is especially the case in that all the world knows only too well what happens to the overwhelming majority of cats that wind up at shelters. In Harvey's case, he initially lucked out in that his first stay at YCR was a short one in that the charity soon was able to place him in another home. Unfortunately, the cats already residing there apparently resented his intrusion and he according was sent packing. As far as that debacle is concerned, there was more than enough blame to go all around. First of all, YCR erred egregiously in placing him in such an environment. Secondly, it certainly did not take his new guardians long in order to demonstrate both their unfitness and unworthiness to care for a such a cat as Harvey and they did so by jerking the welcome mat out from under him almost as soon as he had arrived. It is by no means unusual for cats to sometimes not get along initially but difficulties of that sort almost always can be worked out over time. Patience and a certain modicum of savoir-faire are required but any individual unwilling to invest at least that much in a cat does not have any business adopting one in the first place. Besides, individuals of good will but lacking in expertise can always seek out the advice of cat behaviorists and others who are knowledgeable about the species. A wealth of information regarding such issues also is available online. Anything is far preferable to giving up on a cat and thus returning it to death row at some hellhole shelter. At some undisclosed time earlier this year, another attempt was made at finding Harvey a permanent home when YCR let him go to an unidentified woman living in Leeds, thirty-three kilometers southeast of Keighley, but she likewise returned him when she became ill. As was the case before, YCR clearly dropped the ball once again by failing to verify the woman's ability to care for a cat. In adopting out a cat, it is not sufficient for shelters to merely establish that would-be adopters are willing and financially able to care for one, but rather they also need to inquire about their health as well. In particular, they need to know who is going to be responsible for the cat's continued care in the event that the adopter either becomes ill or dies unexpectedly. Quite often these situations are unavoidable and it is axiomatic that all rescue groups have more cats on their hands than they can properly care for and shelter. Many of them no doubt therefore conclude that any home, even one for a brief period of time, is preferable to having a cat languish in a shelter. No one therefore can really blame shelters for exploring all available options when it comes to rehoming cats. Such an approach fails, however, to adequately take into consideration just how traumatic it is for a cat to be bandied about from one stranger's home to another. So, to sum up, over the course of the past eight months Harvey has been forced to suffer through no fewer than three guardians as well an identical number of stays at YCR. It accordingly is not at all surprising that recent events have left him withdrawn and feeling down in the dumps. "Older cats who lose their owners sometimes find it harder than youngsters to come out of their shells at the center," YCR's Sara Atkinson said in an August 14th press release. (See "Twice Returned Cat Seeks Loving Home.") 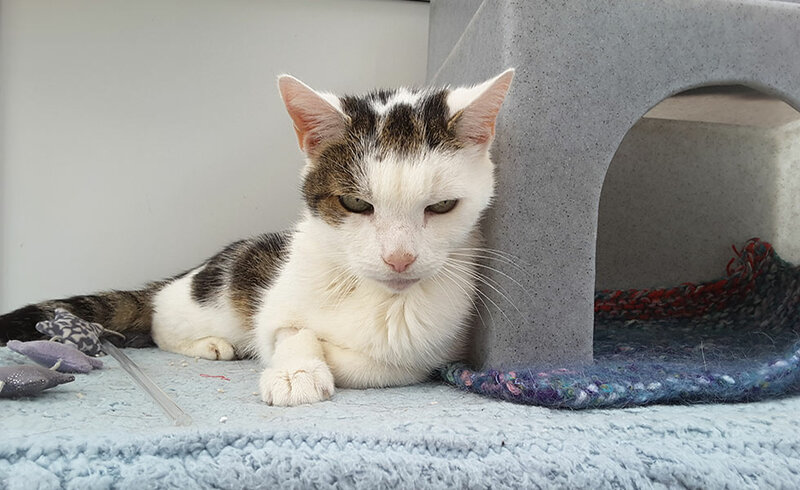 "They just don't feel at home in a pen, and really should be making themselves comfortable on a sofa, with someone who appreciates the benefits of adopting an older cat." That is stating the case rather mildly in that for a cat to wind up at a shelter is a far more harrowing experience than for a previously domiciled individual to be dispossessed and subsequently relegated to living in a homeless shelter. At least the evil individuals and organizations who run the latter institutions are not permitted by law to either cage or kill their inmates and they therefore are free to walk out the door at anytime. It is an entirely different ballgame as far as cats are concerned in that the familiar faces and personalities of their previous guardians are replaced by those that belong to total strangers and the unbridled freedom and respect that they formerly enjoyed are forced to give way to incarceration in a cage without so much as an iota of dignity. Most devastating of all, the sense of security that they once had relied upon is rudely supplanted by fear, stress, and an overwhelming feeling of powerlessness and hopelessness. The smell of death that pervades these wretched gulags for cats is palpable. For all those reasons and more, YCR is pulling out all the stops in a last-ditch effort to place Harvey in a permanent home. "This poor lad has spent the summer with us, and still no luck in finding him a home," Atkinson lamented. "So we're trying our very best to help him tell the world what a lovely lad he is." Generally speaking, however, most individuals only look at the matter through the prism of what a cat can do for them, as opposed to what they can do for a deserving feline in desperate straits, and that in turn leaves precious few opportunities for the Harveys of this world. Not a great deal has been written on this subject but judging by what little that has come to light it does not appear that there are too many happy endings for old cats that have been abandoned by their owners. In Harvey's case, the daunting task of finding him a new home has become considerably more difficult than it was before in that YCR now believes that he is suffering from a small, but benign, brain tumor. That diagnoses was made earlier this summer after he was returned to the shelter for the second time and began to exhibit symptoms of a noticeable decline in his mental faculties. He therefore could be suffering from a growth within either the brain itself or the membrane that surrounds it called a meningioma. Although MRIs, radiographs, and ultrasound imaging can be helpful in detecting abnormal growths, the only sure way of diagnosing cancer is through a biopsy. Since YCR is unsure exactly what is ailing Harvey, that test apparently was not conducted. It accordingly is possible that he could have sustained some type of injury that has produced a buildup of fluid in his head that is mimicking a tumor. Apparently YCR is not planning on treating him. "Harvey's brain tumor shouldn't affect how long he has left to live," the organization's Sam Davies speculated in the press release. "It just means he can get a little confused at times. It looks like he is wondering why he is finding it so much harder to live at the shelter than all the young cats around him." If he does have a tumor but it does not grow, Harvey may be able to live with it. If it should become malignant, however, it will need to be immediately removed if that can be done without endangering his life. Although he may be sickly as well as getting on, Harvey still loves his freedom and the great outdoors and YCR, to its credit, does not wish to deprive him of either of them provided that certain precautions are undertaken. "We feel he might be a little too vulnerable to be roaming the streets or fields on his own," Davies said in YCR's August 14th press release. "So we'd love to find him a home with a safe, and enclosed garden, because he does love the outdoors, and a cat his age should be able to enjoy life -- even if he sometimes forgets where he is." It also is entirely conceivable that the mental fog in which he allegedly is laboring could clear up somewhat if a good and loving home could be secured for him. Since the response from the public has been so appallingly callous, perhaps it is time that either a staffer at YCR adopted him or the charity considered placing him in a sanctuary. Above all, it is imperative that YCR does not give up on Harvey and take the easy way out. As it is, cats live such terribly short lives that to abbreviate any of them by so much as one second is a monumental crime of the first order. As an elderly cat, he additionally is richly entitled to a warm and secure home, good quality food, and topnotch veterinary care. For all that he has given to this world, he deserves at least that much in return. "But he really is completely lovely -- just so desperately unlucky," is how that Davies summed up his tragic plight. It does not have to end for him in a shelter, however, in that all he needs is for one kindhearted soul to ride to his rescue on a white stallion and that would magically transform all of his recent Unglück into, hopefully, everlasting Glück. Anyone who therefore would be willing to either provide him with a permanent home or to make a contribution toward his medical expenses is urged to immediately contact YCR at 44-01535-647184. The charity also can be reached at mail@yorkshirecatrescue.org.